Jenna Wolfe is a TV journalist and lifestyle & fitness expert. Jenna has been sharing her passion for fitness with America for the last 20 years, most recently at NBC’s Today Show, where she was the first ever Lifestyle and Fitness correspondent. It was there that she challenged America to get healthy through national challenges focused on short, easy-to-digest, bite-sized workouts and eating tips. As a sportscaster from 1996-2007, Jenna saw firsthand how treating and training the body can lead to dynamic results on the playing field. 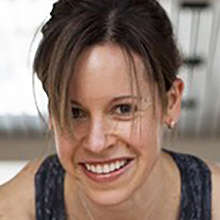 As an advisor to health & fitness app Lose It!, Jenna brings her incredible energy and expertise to the Lose It! community.